2. Short link on edge of the Heath between Parliament Hill and path C. This would provide a link between paths A and C via Tanza Road. i. Path along the footway between Jack Straw’s Castle and Spaniards End. ii. Path above North End Road between Sandy Road and Inverforth Close – particularly for those riding (slowly) up the hill as it’s so narrow and busy. iii. West Heath Road could have a gravel surfaced hard verge on the Heath side to ride along as the traffic in the road is usually heavy. Tanza Road is an essential link between Cycleway A and Link 2. The junction of Well Walk, East Heath Road and Lime Avenue. the bridge from Savernake Road is an essential link to Cycleway A. The links between the bridge and the cycleway should be formalised for cycle access. One of our paths is on the edge of the Heath and the all the others apart from 5, link the cycleways to the edge of the Heath. For cyclists who ride on the non-designated paths, CCC would like the City of London to consider the use of Fixed Penalty Notices with fines comparable to those applied to people who cycle on pavements. In addition, the speed limit of 8 mph should be enforced, particularly when the paths are busy. We have taken catchment data from ten schools that are situated near to the Heath and plotted it on a series of maps. On each map we’ve drawn in desire lines for journeys between home and school. From the desire lines we have inferred how a safe route to each school might be tailored from the existing cycleways and a small number of new links on the Heath. In mid October, CCC carried out cycle counts at five locations on Hampstead Heath on a weekday at school travel times and on a Saturday afternoon. City of London consulted on their new management plan in Summer 2007. No longer on line. CCC Response to Heath Management Plan. A study of times to cycle to the Heath, compared with using bus/train Journey times. Cycling almost always came out best. Camden Council obtained Greenway funding, consulted on and implemented a shared-use path adjacent to the Heath along the footway between Jack Straw’s Castle and Spaniards End during 2008. The result is spoilt by its not being quite end to end. (Description of the Spaniards Path). Pedestrian and Cycling working group started meeting July 2009 and continued until early 2011 with very little gain for cycling. The City of London commissioned consultants Intelligent Space ATKINS to conduct a series of user surveys on Hampstead Heath during the summer and autumn of 2007 in order to determine user patterns, particularly of pedestrians and cycles, user demographics and public opinion. They looked at the suitability of existing routes and some suggested routes for pedestrians and cycles to share. The aims of the Study reflect commitments made in the draft Part I Hampstead Heath Management Plan. An Executive Summary of this Pedestrian and Cycle Observation Study was produced in December 2007. Three CCC committee members (Stefano, John and Jean) attended a Seminar on the report on 12 December 2007. We were very disappointed by the findings. Links 2, 3 and 6 are good enough on their own merits, but are not recommended because heavy max pedestrian flows on (2), the likihood of riding from (3) to an non-designated path and the additional load on cycleway C if (6) is becomes a shared use path. Links 4 and 5 are not up to standard. 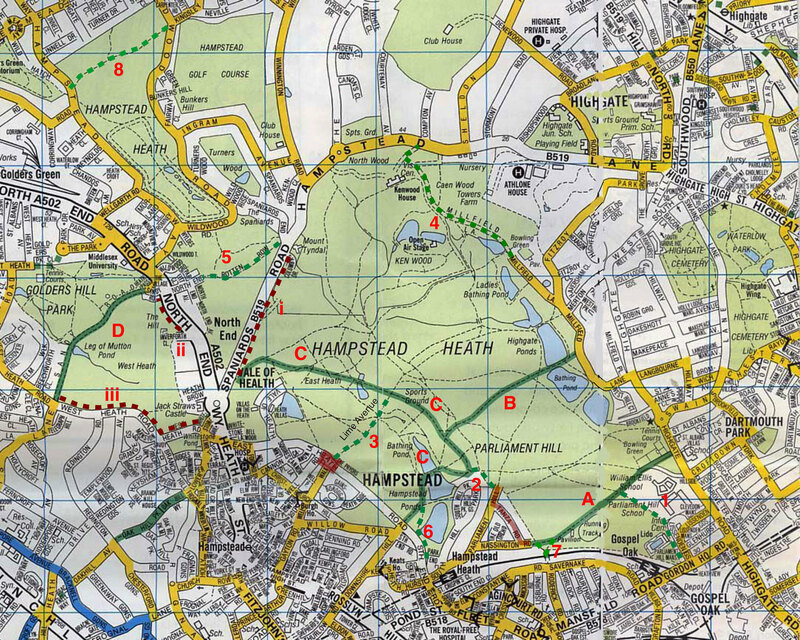 March 31st 2008, Hampstead Heath Management Committee decided that detailed designs for Links 1 and 7 should be implemented for further consideration in May. May 2008 Simon Lee organised walk (with reps from CCC. Heath for Feet and the Consultative Committee) to help WS Atkins to review Routes 1 and 7 in more detail and reviewing certain aspects of Routes B and C.
June 23rd 2008. Hampstead Heath Management Committee received report from Superintendant on detailed designs and costs for Links 1 and 7, speed surveys and equlity impact. Further reports requested for meeting 28th July. Final decision on 22nd September. The speed surveys are worrying – many cyclist cycle above 12 mph, which we now discover is the speed limit (not 8 mph as show on signs). at least October. See Minutes of CCC meeting July 2008 JD had tried to encourage some speedup of this process in order to take advantage of Greenway funding. August 2008 City of London Consultation on Parliament Hill Triangle shows a scheme for Link 1. (Vehicles and cyclists to use separate route parallel to Lido path). City London hope to obtain Lottery Funding to carry out their Master Plan (no longer on their website) They will defer decisions until November 2008. January 2009 CCC asked Simon Lee to tell us the outcome of the consultation and of the date when a decision will be made on the implementation of Links 1 and 7. In short, no news yet about lottery funding, small news on Links B, C (Improvements), 1 and 7 still under considertaion; plans for ped-cyce working group group. May 2009 CCC writes to Bob Hall (retiring chair of Management Cttee), saying we’ve heard that the Lottery Bid failed and asking him to reinstate the original idea for Link 1. June 2009 Simon Lee sends email response to letter to Bob Hall: can’t decide on Link 1 until masterplan for Parliament Hill triangle decided. Sustrans Greenways Consultation CCC suggested Greenway links throughout Camden including Links 1 and 7 and a request that Sustrans work with English Heritage on Link 5. Sustrans will be managing the Greenway funding for TfL from now on. July 2009 Savernake Bridge (news of wheel channel)Read news of opening. Summer 2010. Second wheel channel implemented. First meeting of Working Group. (attended by SC and JD). Terms ref, Greenway funding for improvements to B and C; Link 1 still stalled by Master Plan, now wheel channel in place, City want a staggered barrier for Link 7 . September 2009 Meeting of Working Group (attended by JD)).Site visit to Routes B and C. Update on Links 1 and 7. Deisgn of barriers for Link 7 agreed; Link 1 still waiting for external consultants’ safety studies related to Master Plan (i.e. effect of mixing vehicle, peds and cyclists on Link A (Broadwalk)….. . The results of this study would provide the City with empirical data on which to formulate a rationale with to proceed with the Masterplan. December 2009 Meeting of Working Group (attended by JD) to discuss the Sustrans Draft Report. It seems that there is great consternation amongst the antis that Sustrans mentioned the idea that Link 5 would be an aspiration. Simon Lee had persuaded Sustrans to omit that paragraph. It was also noted that the section on the Heath mentioned the City’s aspirations for cycle routes round the Heath and along railway land to Kentish Town. Simon Lee said once more that we still must wait for news on link 1. January 2010 Meeting of Working Group (JD attended). Route B plans for improvement discussed – move away from hedge to improve views. Link 1- City still waiting for safety report on idea of having vehicle entry via Highgate Road. Link 7 waiting for signs at top of ramp, but will install barrier. September 2010 Meeting of Working Group (No rep from CCC). Route B has been surface but JD, SL and JW to meet to discuss chicanes. Route C and D improvements out to tender. Link 1-changes at Highgate Road SL to look at Link 1 as part of Master Plan. Link 7 CoL want permission from camden for barrier and camden to install signs. Proposals for Shared Use provision – North End Way. November 2010 Meeting of Working Group (SC attended). Route B: JD, SL and JW to met to discuss chicanes. SC protested at use of funds to reinstate existing path, but no new one. Link 1-need to wait for revision of Master Plan. Link 7 CoL waiting for permission from camden for barrier and camden waiting for permission from DfT to install signs. March 2011 Meeting of Working Group (No rep from CCC). Link 7 to go ahead as soon as CoL has installed chicane. No more greenways funding. North End Way – will need to be funded by Camden. Enforcement – reckless cyclists fined heavily in court. Signage and shared use. One more meeting, then terminate group. October 2011. Meeting of Working Group (JD attended). Link 7 still not complete but promised imminently. Link 1: strong support from Ian Harrison and Bob Slowe but Simon Lee said all he can think about at the moment is the dam. Agreed to dissolve the group but JD promised to continue to pursue the matter of Link 1.